One piece of advice I give to jobhunting researchers time and again is to tailor. Always to tailor. If you want an employer to understand what you’ll bring to their team, you have to tell them. And you have to be specific. If after a quick name-change, you could send the exact same application off to another similar organisation, then you’re not being specific enough. For lecturer applications, this means detailing with whom in the department you hope to collaborate, and the new modules or teaching methods you want to introduce. For non-academic positions, you’ll want to show you’re familiar with a company’s recent projects, future goals, and ways of working. Of course tailoring your application will take more time and effort, but that’s part of the value. Employers want to know that you’re committed enough to do your research – that you’ve found out all about them, imagined yourself in the role, and you know exactly how you’ll contribute. A fantastic (and admittedly rather extreme) example of creative application tailoring was reported in Business Insider earlier this week. Nina Mufleh wanted to work for AirBnB, so she put together an online CV (screenshot above) and tweeted it to Air BnB bigwigs. But this was no ordinary CV. 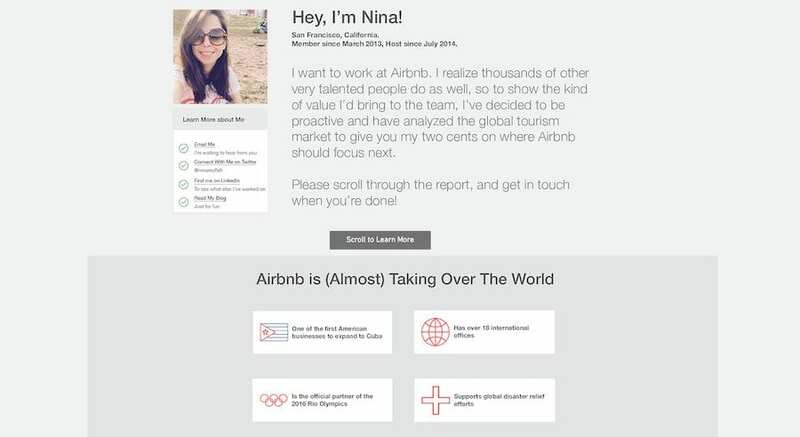 With a format very similar to an AirBnB profile, the CV showcased Nina’s knowledge and understanding of the travel industry, and her vision for the future of AirBnB. It took her a week to put together, but it was well worth it, because it secured her an interview. You can see Nina’s full CV here. If you’re a UCL researcher unsure about how to tailor an application, book a place on our applications workshop or a one-to-one session with a careers consultant. See our website for further details. The aim of this event is to help PhD and other research students with their career planning by providing an opportunity to meet employers from the Life Science sector. The event will begin with an intimate fair which will have a few select organisations. Many of the employers present will be PhD holders themselves. The fair will be followed by one-to-one sessions that will allow you to discuss any questions you might have in further detail with a specific employer on a one on one basis. UCL Careers is undertaking an extensive review in how we communicate with Research students and staff. We are running focus groups to help us shape how we communicate. and “Focus Groups” in the subject field.